Description: Banner Stands - Includes: High quality full colour print & professionally fitted to the Quick Display banner stand base, upright pole, adjusters and supplied ready to display. Inc FREE carry bag. Packaging Details: Box - 1ea. 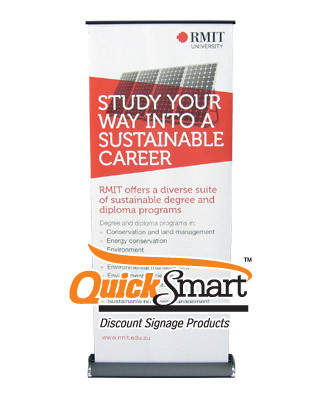 Quick Display Retractable Banner stand is ideal for your business wanting to advertise at exhibitions and trade shows. Ideal trade show signage as it allows you to quickly and easily set it up in your allocated exhibition area. The Quick Display comes ready to go, and is supplied with a FREE carry bag. The artwork is printed onto an UltraSmooth Banner material, and is professionally fitted and installed to the Quick Display base.